Videoslots Casino Review: Bonuses and Extra Spins! 76% of new players recommend this casino 40 new players chose this casino today! There is a lot more to Videoslots than its massive collection of slot games. At this fantastic online casino, you can find hundreds of table games, a live casino section, and an incredible welcome bonus! You can find everything you need to know in our exclusive review below. Aside from bonuses from new members, if you join Videoslots you are eligible enter their Weekly Casino Race. You do not actually need to opt in, all players are automatically registered and the 4,864 players who collect the most leader-board points will receive up to €500! On Videoslots every spin over €0.20 will get you 1 leader-board point, while spins over €1 will get you two, and over €2 spins will get your three points. These points are collected automatically so all you need to do is relax and spin the reels your favorite slots and, with a bit of luck, you may just win an additional cash prize while you play! 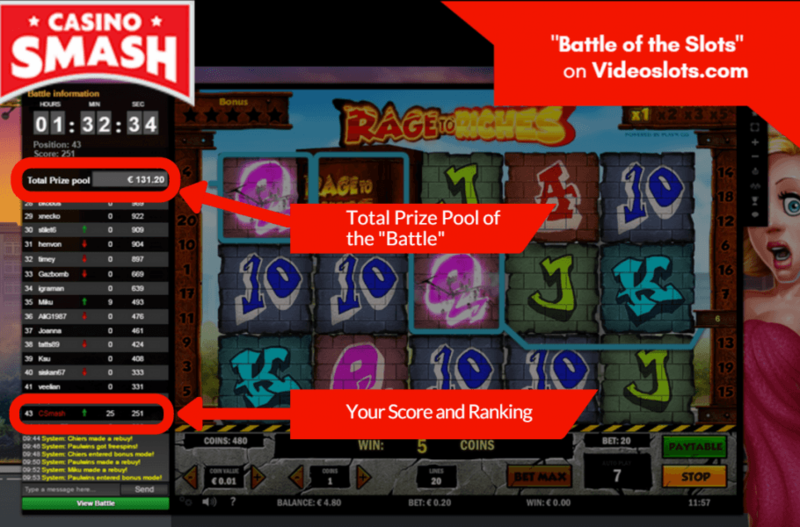 The Battle of Slots is another bonus game that can be found on Videoslots’ lobby. All you need to do is log in and click on the ‘Battle of Slots’ button. You can enter battles with other players to play for mini jackpots and the way this works is that if, for example, 100 players enter the game each player will receive 100 free spins worth €0.20 each and the player who wins the most will be named the battle winner. With plenty of games on tap, Videoslots competes with top casinos in the business when it comes to its unique features and special tournaments for players. At Videoslots you can find some of the hottest progressive jackpots on the market, boasting jackpot amounts that total nearly 10 million! Some titles include Mega Moolah, Mega Moolah Isis, Mega Fortune Hall of Gods, and Arabian Nights. Aside from having great slot games to choose from, the most unique feature we found on Videoslots was their Battle of Slots game. Players can choose from a wide variety of tournaments with different buy ins and conditions to compete with other players for different pots. The winning prize would depend on the battle, and some are for guaranteed cash sums while others are for free spins. You will receive a fixed number of spins at first as do all entrants and the winner of the battle claims the prize! With nearly 70 versions of blackjack and almost 90 video poker varieties it is without a doubt that Videoslots sports an impressive collection of table games in addition to a substantial number of slot game titles. Their collection of classic games extends beyond card games, with plenty of roulette tables to choose from as well as scratch cards and craps. You can also find keno, baccarat, bingo and several types of poker such as Caribbean Stud, 3 Card Hold’em and Pai Gow Poker. There is also a live casino section, where their live dealers are waiting to welcome you to your favorite casino tables. All of Videoslots’ features work through instant play, meaning that there is no need to download or install any software to play. Just go to their website, log in and play your favorite video slots or table games. Videoslots can be accessed through any portable device with an internet connection and working web browser. Their mobile platform works on any portable device, just go to their homepage and log in to access Videoslots on the go. If you want to contact Videoslots’ customer support, there are plenty of ways to get in touch. You can search their extensive FAQ for answers and if you still can find what you’re looking you can contact a customer service agent through live chat, e-mail, a telephone hotline and even an office address to visit should you be in the area. From the impressive Battle of Slots game to an excellent mobile platform, both new and long-time members have something special to look forward to when playing at Videoslots. With a great bonus that includes both extra spins and cash, you can find just about any game you’re looking for and more at Videoslots. There are many deposit options on Videoslots. You can choose the most convenient one for you. 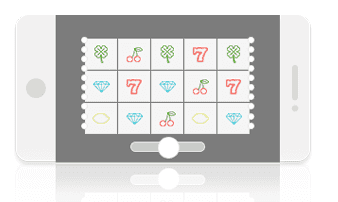 You will receive 11 free spins in a random game upon first registration. You have 7 days to activate the bonus, once activated free spins must be used within 24 hours. All winnings from free spins need to be wagered 40 times in the same game as the free spins were given within 24 hours to be eligible to make a cash out of the winnings. You can withdraw a maximum of €10 from your winnings.